The furniture, light fixtures and the overall look and feel of each Vignale Lounge will be inspired by the vehicles sold as part of Ford's new premium trim line for Europe. Vignale-badged versions of the new-generation Mondeo (shown) will arrive in showrooms next summer. Ford Motor Co. is the latest automaker to borrow ideas from technology giant Apple with the hope that the connection will provide a boost to its retail network. The U.S. vehicle manufacturer will rebrand 500 dealerships, mainly in northern Europe, as Ford Stores, which will stand out because each will have dedicated space to feature models from the company’s new Vignale premium trim line that will launch next year. "The Ford Store is where the Ford brand will express itself at its best," Ford of Europe Marketing Vice President Gaetano Thorel told Automotive News Europe at a press event in Cologne, Germany, in June. The Ford Store is a part of a wider refresh of more than 2,000 dealerships selling the automaker's cars in western Europe. The upgrade will be completed by the end of next year, Ford of Europe President Stephen Odell said at the same event, where the automaker debuted the Edge large SUV ahead of its European sales start in 2015. The company is looking to improve its margins by selling higher-spec, higher-priced cars in Europe as it strives to return to profit in the region after years of losses. From 2011 through 2013 Ford of Europe had a combined pre-tax operating loss of about $3.4 billion. The company expects to lose money again in Europe this year before returning to profit in 2015. Along with Apple, Ford Stores were inspired by coffee maker Nespresso, Thorel said: "To me it’s about looking beyond the product to the experience. Apple, Nespresso, they are experience brands." Ford's use of the "store" tag follows similar efforts by both BMW and Tesla Motors, which also took the idea from the Apple Store concept. All Tesla dealers have the name Tesla Store, while BMW has opened a so-called Brand Store in two locations to showcase the firm’s vehicles. BMW has taken its Apple inspiration a step further by outfitting some dealership with Product Geniuses, who provide a function similar to that offered at Apple Stores’ Genius Bars, which is assistance on products or technical support without any pressure to make a new purchase. The Ford Store network should be fully operational by the time the first Vignale-badged Ford Mondeo mid-sized sedans arrive in showrooms next summer, Thorel said. The upmarket trim line will also be used for the new S-Max large minivan. All of the top-of-the-line versions will be sold from Vignale Lounge areas within the Ford Stores, Thorel said, adding that the lounges will not be physically separated from the rest of the Ford Stores. He said Vignale customers also would receive special perks such as free carwashes and free shuttle service when their cars require service or maintenance. With each Ford Store “the physical experience will match the Ford digital experience,” Thorel said without going into detail. Ford has previously said it wants to offer customers who visit its dealerships a better understanding of the technology that goes into its cars. Thorel said the 500 Ford Stores mostly would be located in northern Europe. “You can imagine the high-revenue markets are the ones: Germany, Britain. Unfortunately the southern European market is in trouble at the moment,” he said, referring to markets such as Italy, Spain and France, which were hit hard by the region’s recession and the six-year slump in new car sales. He added, however, that Ford Stores would be located in most medium-sized and big cities. 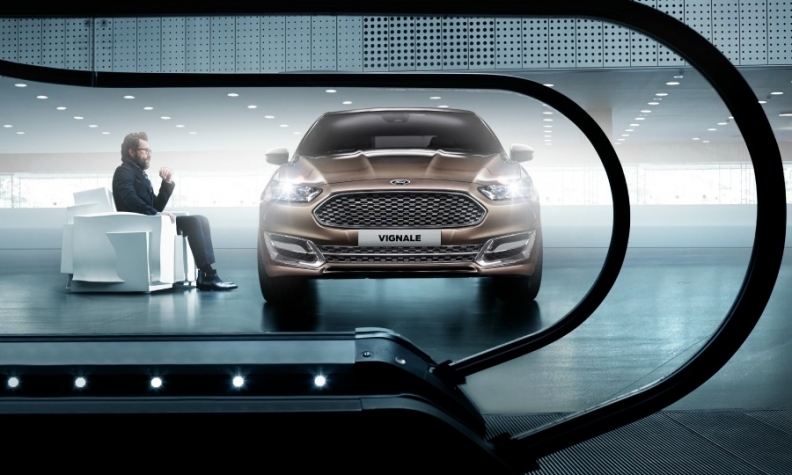 Ford expects Vignale-badged vehicles to account for 10 percent of sales in their respective model lines and 5 percent overall in Europe. More Vignale models are expected to be announced in the future.